The port of Finikas is more used as a yacht charter base than Ermoupolis port, yet the latter has one of the most attractive approaches of the Aegean Sea. 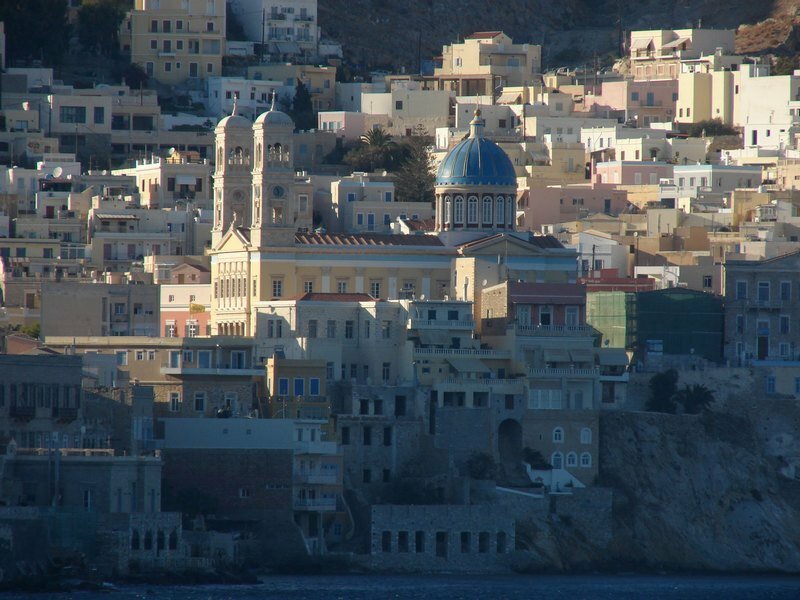 When sailing in Greece a visit to Ermoupolis and its winding streets and beautiful churches is a must and a highlight in any itinerary into the Cyclades. The luxurious charter yachts and motor yachts dock here but also the many bareboat sailing yachts that can be chartered in these waters north of Paros and Ios. The adjacent islands of Tinos, Amorgos, and Andros, along with Mykonos and Delos - be sure to explore Delos with a tripperboat from Mykonos since anchoring at the archaeological site yourself is strictly regulated. Via yacht charters out of Athens or Lavrion, you can perfectly include Syros ports and anchorages in a 7-day itinerary, together with Kea and Kythos with lie further to the west. This gem of an island is naturally also frequented by the more luxuriant motorsailers and gulets (also referred to as gullets) that are stationed in this part of the Cyclades.